You can forget your Canon Digital Ixus', when it comes to a real man's compact camera you can't do better than the Seitz 6x17. It takes massive 160-megapixel pictures, has a minimum exposure speed of 1/2000 second per pixel and can take one snap a second, measuring a massive 900MB in size. 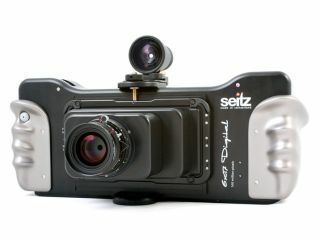 Of course the Seitz 6x17 is no ordinary compact. Part of a four-model range that comprises three mobiles and one studio camera, it's been designed to take stunning landscape shots and requires biceps the size of bison - its weighs 1.25kg, and measures 465mm x 175mm x 95mm. That's the same size as a Mini Clubman. The Seitz 6x17 isn't particularly cheap either. The 46'300 CHF version is a snip at €29,270 (£21,880) and prices spiral upwards from there. Seitz recommends you use an offboard tablet PC to control the whole shebang, and you'd better make sure it has a large hard drive - you'll need one to store the Seitz 6x17's pictures too.